Smoothies are a rage all over the world. Smoothies for breakfast, smoothies for in between meals, smoothies for lunch, smoothies for desserts, the options are endless. What is actually a smoothie? Hadn’t even heard of the word smoothies when I was growing up. Smoothies are drinks that usually are pretty thick in consistency, are cold and very filling. Its like having a meal in a glass. What do you need to make smoothies? j) oats, cooked millets, millet flours etc. Any combination of the above makes a smoothie. 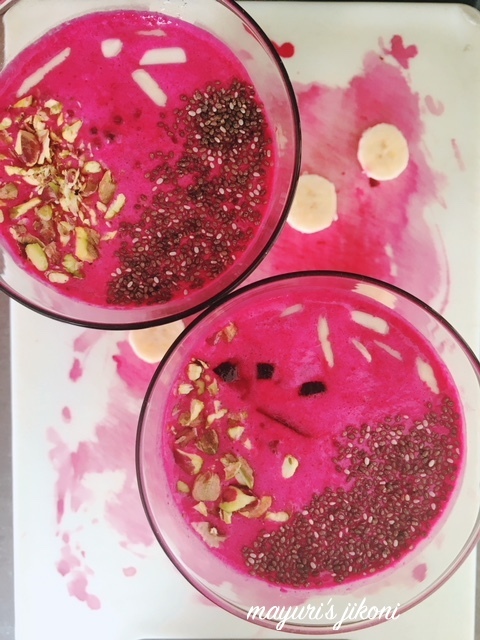 How did the banana beetroot smoothie appear in my kitchen? Well, I love having smoothies for breakfast and I tend to add oats to my morning smoothies. Just before traveling to Nairobi, I had one small beetroot left in the fridge and some bananas. So breakfast before the trip was a healthy pink reddish smoothie. I didn’t need to add any sweetener as beetroot and banana are both naturally sweet. However if you want it extra sweet add a sweetener of your choice. Check out easy and nutritious smoothie. Filling and delicious too. Put the frozen banana, chopped beetroot, cardamom powder, oats and milk or yogurt into a blender jug. Process till you get a smooth consistency. Pour the smoothie into serving glasses. Top with chopped nuts and chia seeds. Serve. Cut bananas into slices before you freeze them. Its best to place the slices on a tray and freeze. This way its easier to process the slices rather than a lump of frozen banana. If you don’t have frozen banana then use fresh ones. Add ice cubes to get a thick cold consistency. You can used boiled, steamed or roasted beetroot or raw. Both taste great. Add 1-2 tsp cocoa powder for a chocolate banana beetroot smoothie. When I was chopping the beetroot, I thought it looked so good on the chopping board so used it. Thanks Rita. This is just perfect for a healthy wholesome breakfast I am sure it will taste yum thanks for sharing. It definitely is Soma, please try it. Thats an extremely attractive smoothie definitely, its been a while i whisked some smoothie with beetroot, you are pulling me to make some. Paris weather is also super hot to have some chilled smoothie rite now. Thanks Priya, smoothies has become my favorite breakfast. Miss it when I don’t have it for 2-3 days. Wow.. what a lovely colour of the smoothie. Never tried this combo. Thanks Shobha. Try it as its filling and healthy too. Wow, They look really awesome..i’m sure this combo must be a great taste, Beautiful recipe. I’m all about smoothies for breakfast these days. This looks superb and must be filling too with oats and chia seeds. Thanks Maria and yes it is filling. Perfect breakfast, Healthy share Mayuri. Thank you so much Paarul. Lovely share Mayuri, such a beautiful colour ! I have yet to try out this combo di. The smoothie looks stunning with that gorgeous pink color ! Thanks Poonam, try it its yummy. Fabulous smoothie recipe. banana would make it a little sweeter, oats and chia seeds will make it power packed. I like this, you have many smoothies recipes. Thank you Bhawana. The beet and banana make it sweet so no need to add any sweetener and yes I do have quite a few smoothie recipes. Beetroot in a smoothie sounds delightful, kids would gulp it down as this smoothie has that beautiful pink hue. Thanks Jagruti and I’m sure they would as its colorful. Well I also love to start my day with smoothies and this one with beets looks very inviting.